Territorial conflict is an old story in the South China Sea, where several nations make conflicting claims on the region—and its oil and gas potential. But the escalating conflict between Vietnam and China is something new altogether. Starting May 1, naval and coast guard vessels of Vietnam and China have engaged in a high-stakes game of chicken, battling with water cannons and reportedly ramming each other in an area of the South China Sea less than 150 miles from Vietnam's shores where China has inserted a huge, mobile oil-drilling rig. 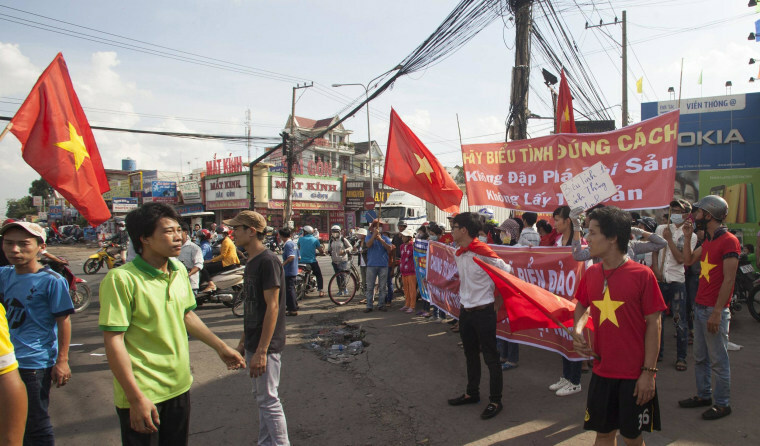 Thousands of Vietnamese protesters took to the streets Wednesday, setting fire to factories they thought—sometimes incorrectly—were connected to China. On Thursday, up to 21 people were killed as the riots turned deadly. But the area near the Paracel Islands where China National Offshore Oil Corporation (CNOOC) has placed a rig, known as HD-981, is conspicuous not for the oil and gas resources that lie there, but for the oil and gas resources that don't. Rather than targeting an energy-rich zone, Beijing is simply interested in pushing its neighbors as much as possible to maximize the swath of sea it ultimately will control, experts told CNBC. "[The placement of HD-981 is] less about practically developing that specific block, and more about the Chinese sending a calculated and pretty aggressive warning to the Vietnamese that they aren't OK with the Vietnamese developing there." "[The placement of HD-981 is] less about practically developing that specific block, and more about the Chinese sending a calculated and pretty aggressive warning to the Vietnamese that they aren't OK with the Vietnamese developing there," said Ernest Bower, a Southeast Asia expert with the Center for Strategic and International Studies. But after years of planning to exploit the oil and gas reserves in the South China Sea, CNOOC could hardly have placed the rig in a less promising location. The area has less than 1 million barrels of oil equivalent in proved and probable reserves, economist Alexander Metelitsa of the U.S. Energy Information Administration said in an email to CNBC. The U.S. Geological Survey study "did not assess this part of the South China Sea to have any significant oil or gas containing basins," Metelitsa said. State-owned CNOOC has aggressively moved forward with plans to get into the deepwater drilling business, said Kang Wu, vice chairman for Asia at international energy consultancy Facts Global Energy. That means stretching out into new territory. "China has been [drilling] offshore for many years, and they've been producing OK … but that kind of oil is running out," said Wu. "If you want to expand your production base, you have to go out." CNOOC did not respond to CNBC's request for comment. The rig may be a powerful message of China's intentions in the region, but it is also an expensive one, said Bower, estimating that the operation of a rig on an exploratory drilling mission so far away from regular support costs hundreds of thousand of dollars each day. CNOOC has indicated that it plans to keep HD-981 at its current location until August. In May 2011, CNOOC completed construction of the Hai Yang Shi You 981 deepwater semi-submersible drilling rig at a cost of about $925 million, according to Metelitsa's agency. The rig drilled its first well in May 2012. One year later, Vietnam detected the 114-meter-long rig moving into position southwest of the Paracel Islands—an area Hanoi considers its continental shelf. (The particulars of the geography are discussed here). HD-981 already had a reputation. Describing it as a "mobile manifestation of Chinese sovereignty," Bower said it represents Beijing's plan to assert its claims over as many of the South China Sea's resources as possible. Current estimates for the entire South China Sea stand at 11 billion barrels of oil and 190 trillion cubic feet of natural gas in proved and probable reserves. That's more oil than Alaska had at its peak in the 1970s, and more than twice as much gas as the Hugoton field in Kansas, Texas and Oklahoma. Ultimately, Bower does not expect that China will be in a position to set up a firm drilling operation so close to Vietnam's coast, as it would be expensive to set up a pipeline back to the Chinese mainland, and the cost of international criticism would be too great. China, however, may have gained more leeway for other deepwater operations with its recent move. Vietnam, meanwhile, can hardly afford to lose any of the reserves on its continental shelf. Although it was a net petroleum producer as recently as 2010, its consumption numbers have skyrocketed: It now consumes 413,000 barrels per day, compared with 352,000 produced, according to the EIA. Despite previously designating two hydrocarbon blocks in the area immediately around HD-981, state-owned PetroVietnam has not made any public attempt to capitalize on the resources there. Hanoi has condemned China's actions on a daily basis since HD-981 neared the Paracel Islands, and its prime minister called for fellow members of the Association of Southeast Asian Nations to "strengthen solidarity and unity" in the face of China's "continuing [moves] to escalate its increasingly dangerous and serious acts of violation." But sating China's hunger for natural resources may ultimately be beneficial for the entire region, Bower said. "You really can't have a stable Asia if China doesn't feel comfortable with its energy security," he said. As of Tuesday, China had deployed more than 80 ships to guard the rig, the Vietnamese Embassy in Washington said in an email to CNBC.